This workout involved two stations – one working underwater kicks and one doing an IM set. We did each station 3 times — the cord set was the same each time, and the IM set progressed through the three versions listed. The 3rd round was essentially a broken 400 IM. If you like this set, sign up to receive “the wake-up swim,” my weekly newsletter with updates from the blog plus tons of other interesting and helpful resources. Another issue of “the wake-up swim” was published this week. Check out the archives here to see what you’ve missed or you can sign up here. We only have enough powerbags for about 1/3 of our group to wear at a time. Thus, we split the set up as indicated. Underwater focus, pop up “between the 15m marks” every length! All 3 = Max Underwaters Descend, 3 rd is all out still with max underwaters! 1-4 Freestyle w/ paddles and short fins, DESCEND! the yellow, still descend time! ALWAYS max out last 25 underwater effort! 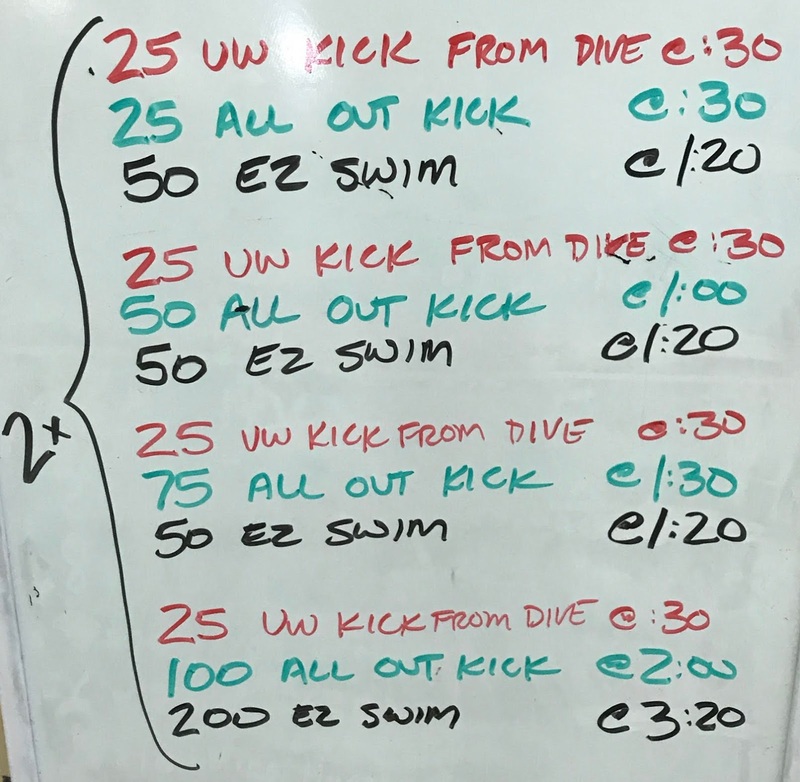 We did a version of the following kick set to challenge our dolphin kicking ability and to probe the limits of our ability to kick fast underwater. 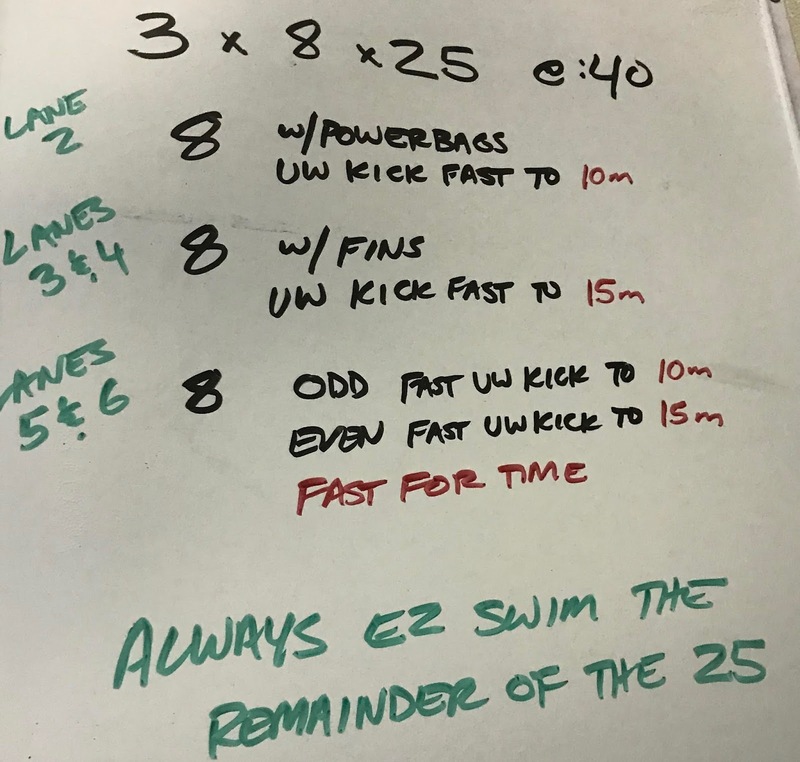 We used Finis Tempo Trainers and did the first round with the beeping tempo set at .60, second round at .50, third round at .45, fourth round at .40. Some swimmers were able to maintain an effective dolphin kick down to .40. Others lost “hold” on the water and became inefficient. This is potentially useful information for our training. Simple Underwater Kick Set if You Have a Diving Well that is 10-15m Long. Working underwater. SCM. Second round intervals get :05 faster.